St. Raphael Roman Catholic Parish Church, Kingston-upon-Thames. From left to right: (a) View from the back of the nave. (b) Closer view of the chancel. 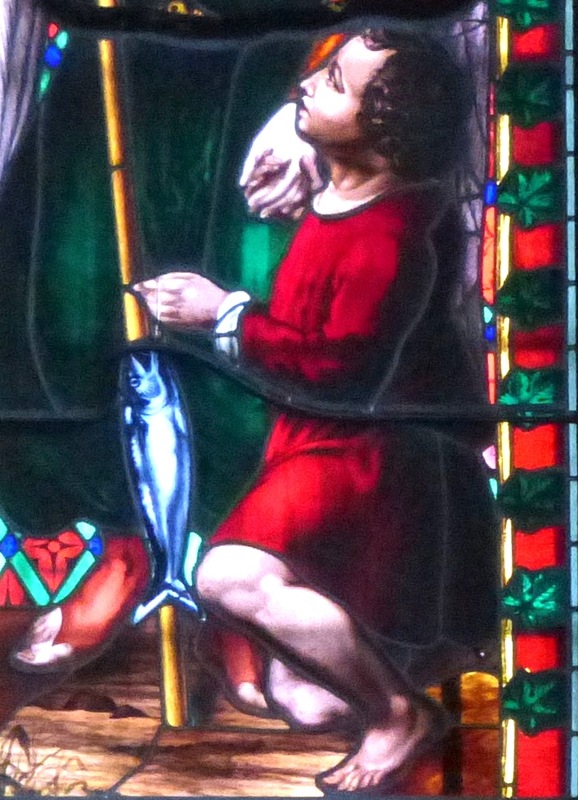 (c) Figures in the east window. 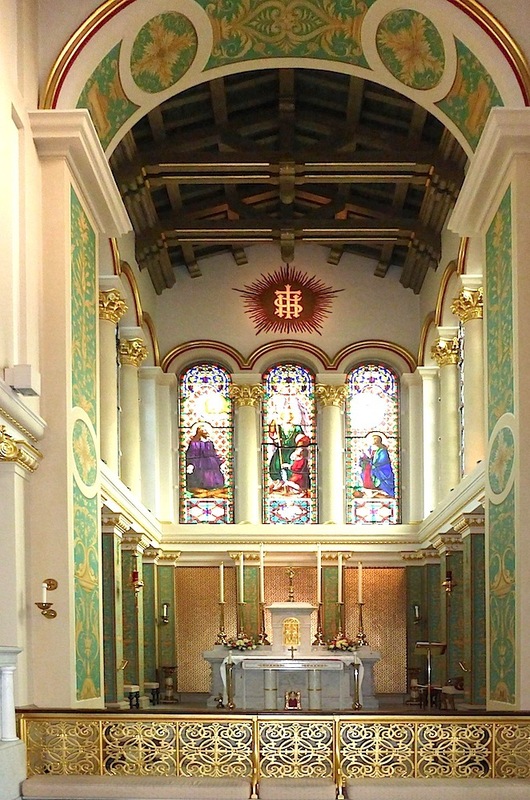 The church interior has brightly stencilled wall panels and intradoses (the inner curves of the arches along the aisle arcades and in the chancel arch), gilded Ionic capitals on the columns, and an embossed Christian monogram over the east window, picked out in gold and surrounded by bright rays shining like a star over the whole church. The edge of the marble pulpit can be seen to the left of the chancel. 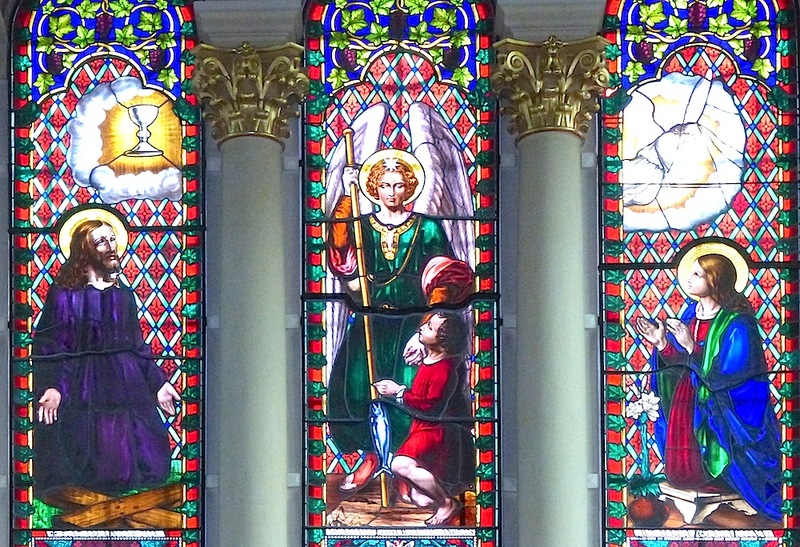 The three lights of the round-arched east window show the Agony in the Garden, the Angel Raphael with the young Tobias, and the Annunciation. The window may date from 1846 (see Eberhard), but seems not to have been identified. From left to right: (a) Closer view of the young Tobias. (b) Closer view of the Virgin Mary. (c) The baptistery to the north of the chancel. 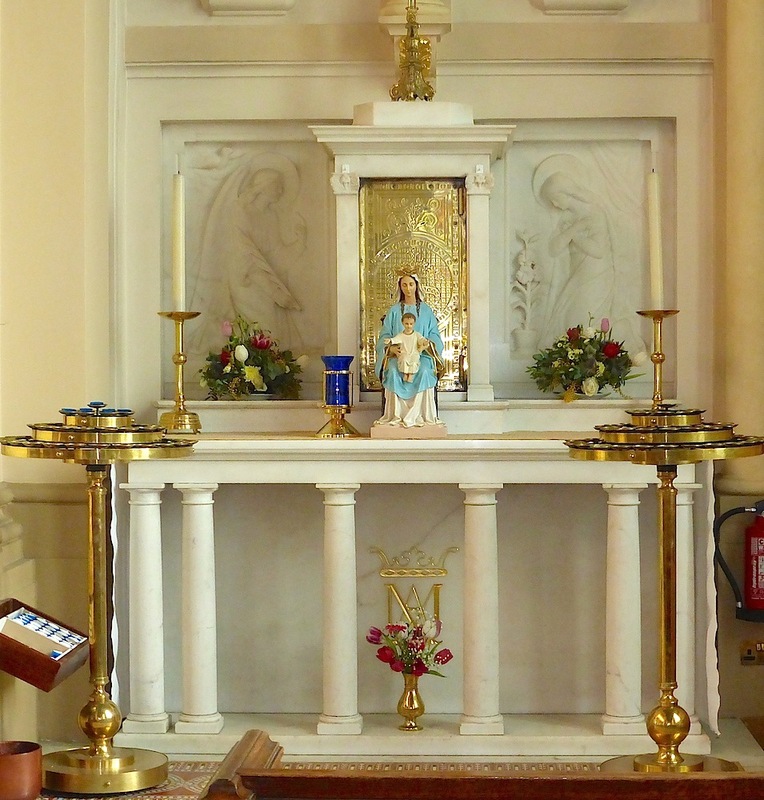 The font, like the pulpit and altars, is of white Sicilian marble, and has an elegant cover. In the three niches above the baptistery are full-size painted plaster statues: St Peter with his key, Jesus displaying the stigmata, and St Paul with his book and sword — the latter having been the instrument of his martyrdom. The statues are thought to have originated in Germany ("Structure and Architecture"). 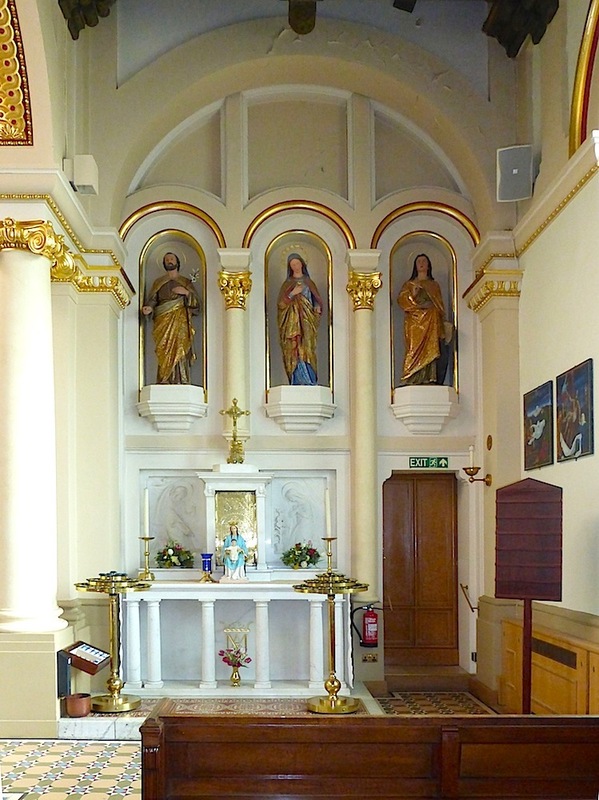 From left to right: (a) The Lady Chapel to the south of the chancel. (b) The timber-panelled and sturdily braced nave roof, also showing the attractive clerestory windows with geometrically patterned stained glass, and oculi below. (c) Looking towards the organ loft and west door. The marble reredos in the Lady Chapel is a beautifully carved representation of the Annunciation, with the angel Gabriel kneeling on one side, and Mary on the other side beside a growing lily [closer image here]. 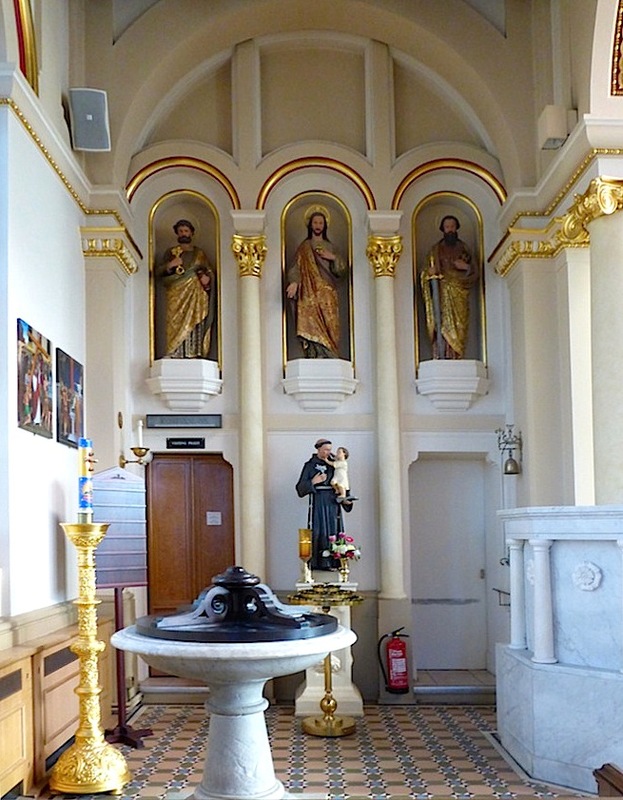 Above it in the niches is another set of statues, like those in the north chapel. These are the figures of Joseph with a lily stem, Mary, and St John the Evangelist with flowing hair, red and green garments, and pencil and scroll. 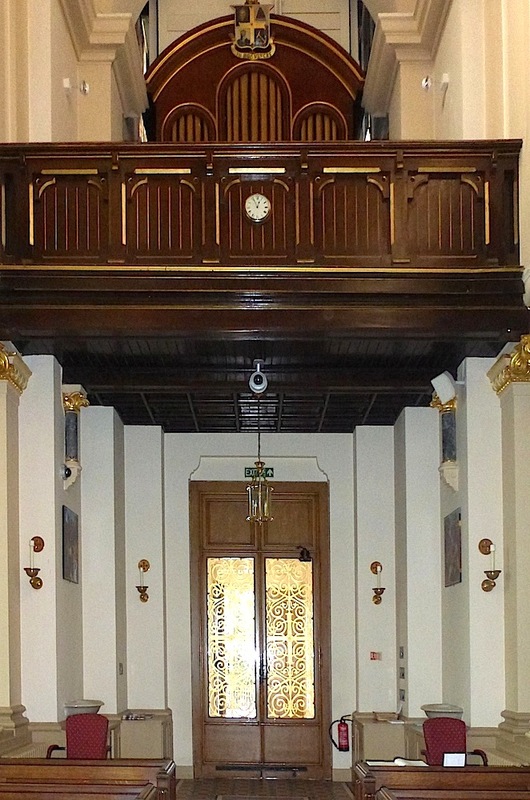 The gilded ironwork of the west door harmonises well with the ironwork of the communion rail. 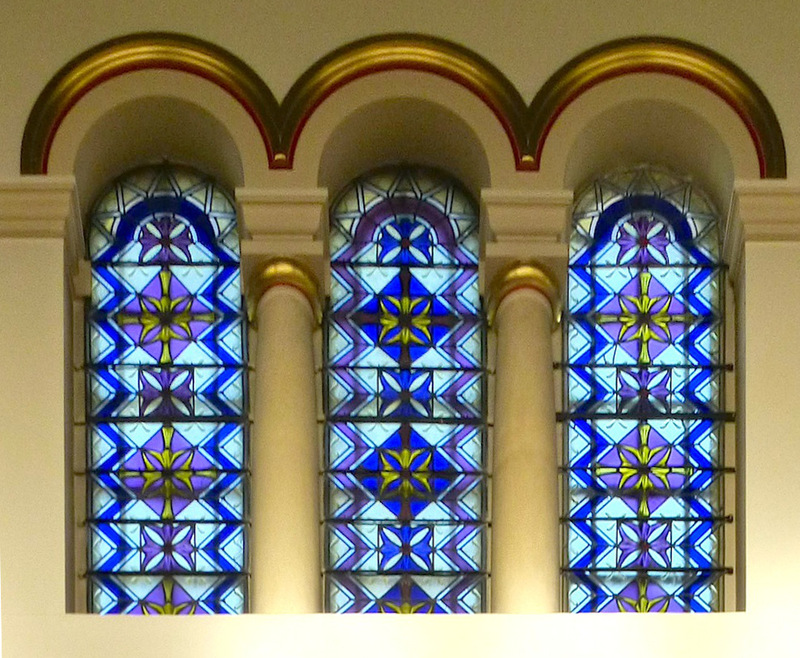 One set of round-arched clerestory windows. St Raphael's was evidently rather a special church, since the organ was made by Bishop & Starr, organ-builder to Queen Victoria: Chopin is reputed to have played on it ("Structure and Architecture"). 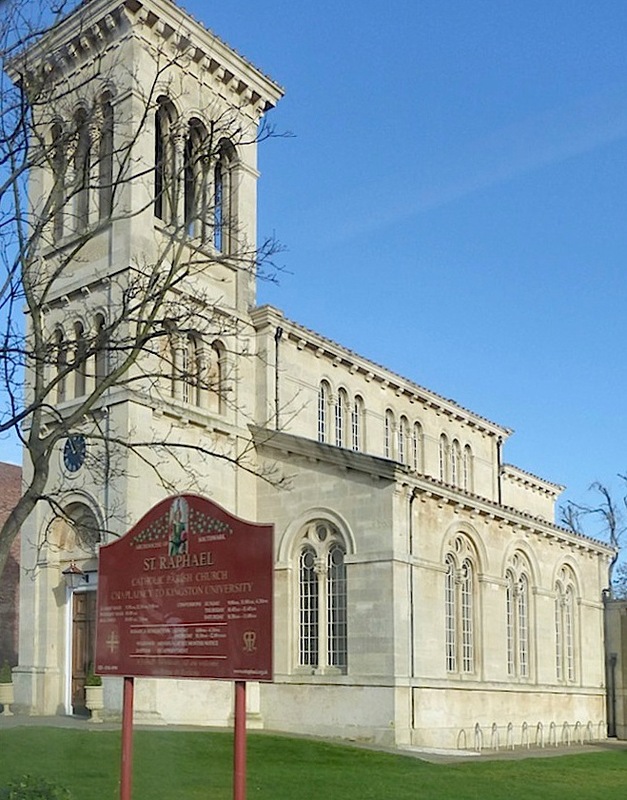 This may be because of its connection with the exiled French royal family, living at nearby Claremont, several members of which were married here in the presence of the future Edward VII and his wife Alexandra (see "St. Raphael Catholic Parish Church"). The building was funded by politician and philanthropist Alexander Raphael (c.1775-1850), a Catholic Armenian whose family came from India. After Catholic Emancipation, he had been the first Catholic Sheriff of London; he also served as the first British-Armenian MP. 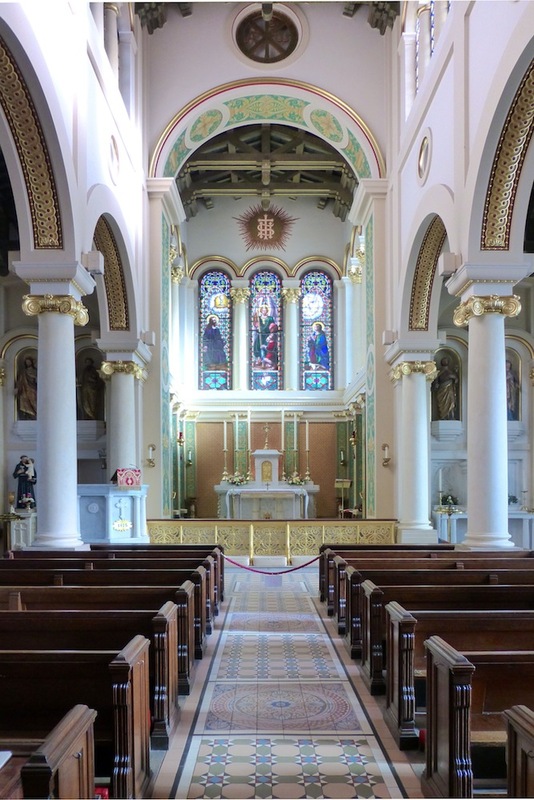 According to the church's own website, he had built the church as a family chapel, leaving instructions for it to be opened for public worship after his death. In this way it became the first post-Reformation Catholic Church in this busy market town. The architect Raphael chose was also something of a pioneer: Charles Parker, who had a successful London practice and professional career, was one of the original fellows of the Institute of British Architects (afterwards the RIBA) and was later appointed steward and surveyor to the Duke of Bedford's important London estates. This quite small church is all of a piece and well deserves its high statutory listing. But perhaps Parker's main achievement was to have promoted the Italianate style in domestic architecture through his influential Villa Rustica, selected from the buildings and scenes in the vicinity of Rome and Florence, and arranged for rural and domestic dwellings; with plans and details (1832, 2nd ed. 1848). Interestingly, some of the Victorian housing near this church (for example, around St Andrew's Square) has Italianate features too. 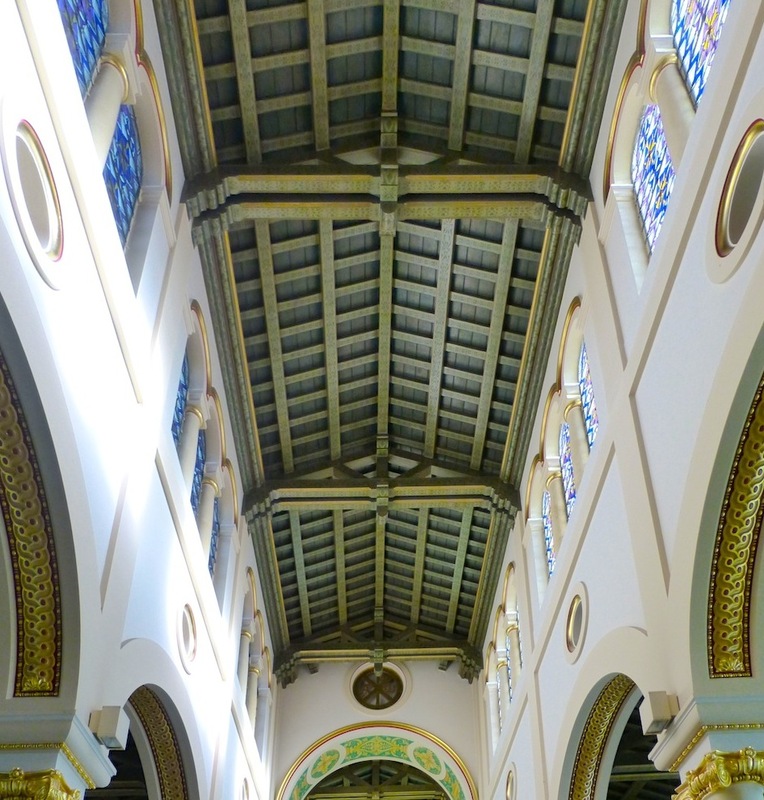 An active church, St Raphael's serves as the Catholic chaplaincy to Kingston University. The church is resplendent both inside and out, the brightness of its decorative scheme surely owing much to its recent (2009-12) restoration. Photographs and text 2008 and 2016 by Jacqueline Banerjee. 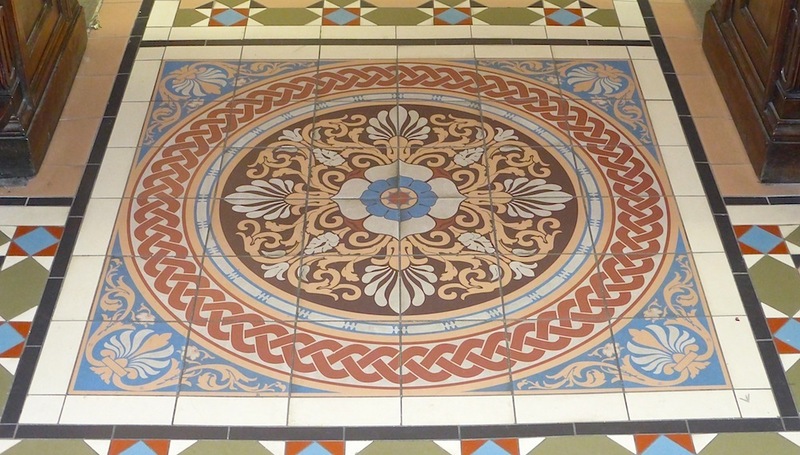 You may use these images without prior permission for any scholarly or educational purpose as long as you (1) credit the photographer and (2) link your document to this URL or cite the Victorian Web in a print document. Many thanks to St Raphael's Church Manager, Michael Pearce, for setting me right on a couple of points. 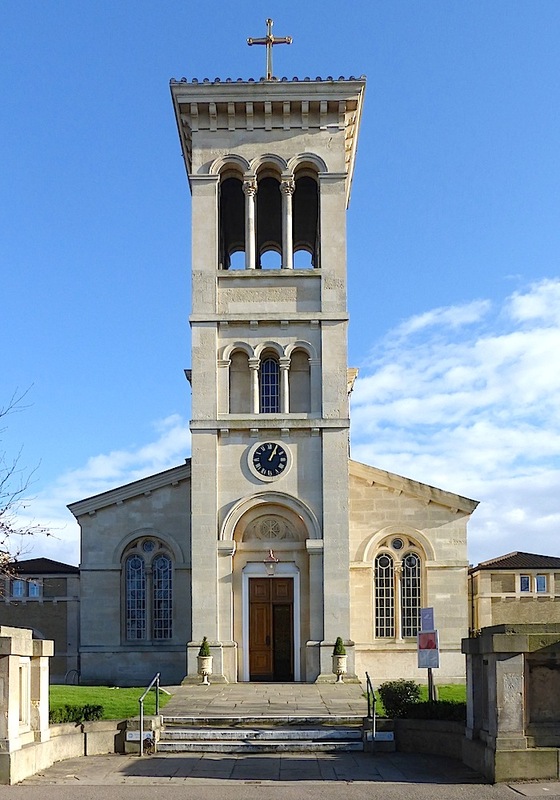 "Church of St Raphael." British Listed Buildings. Web. 11 February 2016. Eberhard, Robert. 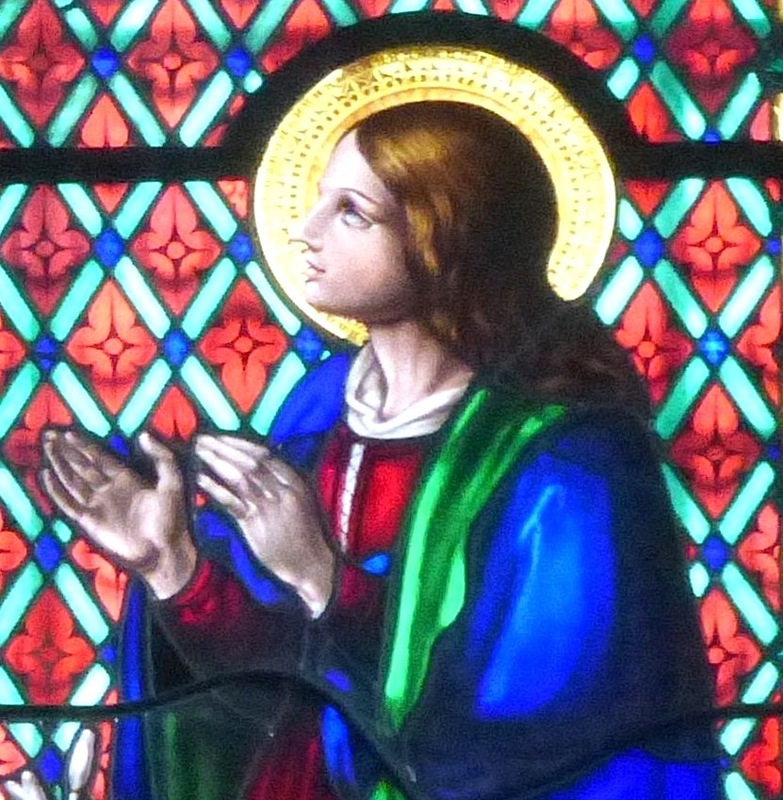 "Stained Glass Windows at St Raphael, R.C." Church Stained Glass Windows. Web. 11 February 2016. Goodall, M. A. "Parker, Charles (1799-1881)." The Oxford Dictionary of National Biography. Online ed. Web. 2 October 2008. Malden, H. E., ed. "Kingston-upon-Thames: Introduction and borough." A History of the County of Surrey: Volume 3. London, 1911: 487-501. Web. 11 February 2016. "Our Church and Its History." St Raphael's Church website. Web. 11 February 2016. Pevsner, Nikolaus. The Buildings of England: Surrey. Harmondsworth: Penguin, 2nd ed. 1971. "St. Raphael Catholic Parish Church and Chaplaincy to Kingston University. Mass of Consecration. 28 September 2012." Web. 10 February 2016. "Structure and Architecture." St Raphael's Church website. Web. 10 February 2016. Last modified 11 February 2016.